The final EPA determination for Major Source Boiler MACT are Area Source Boiler MACT were published on January 31, 2013 and February 1, 2013, respectively. Specific rules are applicable to facilities determining how their existing units are categorized from a compliance standpoint. • If a facility/operation emits 25 tons or more per year of any combination of hazardous air pollutants (HAPs), it is also considered to be Major Source. 1Temporary boiler mens any gaseous or liquid fuel boiler that is designed to, and is capable of, being carried or moved from one location to another. A boiler is not a temporary boiler if the boiler remains at a location within the facility and performs the same or similar function for more than 12 consecutive months. 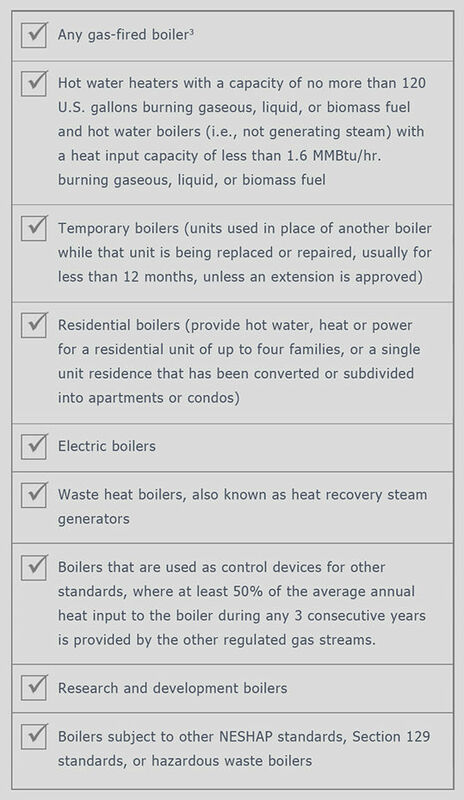 2Residential boiler means a boiler used to provide heat and/or hot water for a dwelling containing four or fewer families, or a single unit residence dwelling that has since been converted or subdivided into condominiums or apartments. • Facilities and operations that emit smaller levels of hazardous air pollutants (HAPs) - less than 10 tons per year of a single hazardous air pollutant and less than 25 tons per year of any combination of hazardous air pollutants. It is important to note that Area Source Boiler MACT regulates only boilers. 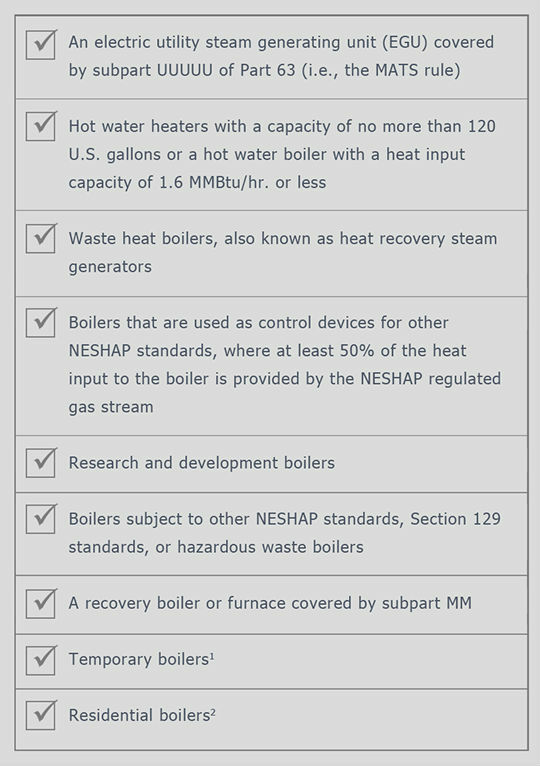 The following sources are exempt from regulation under the Area Source Boiler MACT. 3Gaseous fuels include, but are not limited to: natural gas, process gas, landfill gas, coal-derived gas, refinery gas, hydrogen, and biogas. Gas-fired boiler includes any boiler that burns gaseous fuels not combined with any solid fuels. A gas-fired boiler that periodically fires liquid fuels during periods of gas curtailment, has supply interruption, startups, or for periodic (not to exceed 48 hours per year) testing is still considered a gas-fired boiler. - What Are the Rules? - Where Do I Start?